An Army Arising is about this moment in history, and God's secret weapon to change the world. Today is the moment of the story, and artists are the best equipped to seize this moment. In the past seven years there has been an emerging renaissance movement in the church. God is raising up arts ministries and artists in a new way. An Army Arising includes a study of the artist in the Bible, a review of how Christian doctrine impacts the arts, and practical tools for artists and creative people to be warrior artists. In 2006 Christ John Otto experienced several months of extraordinary encounters with God that became the nucleus of his ministry, Belonging House. During that season he received a clear call from God to "raise up an army of artists to build Jesus a throne in the earth." For the past seven years Belonging House has prayed, pondered, and preached those words. This book is the result of the past seven years. 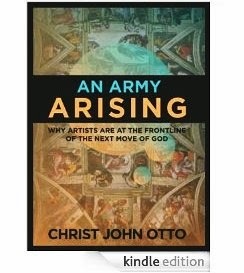 An Army Arising distills all we have learned about the call of God to the artist.